Home // Careers // Why study immunology? Immunology is an incredibly exciting and broad area of the biomedical sciences. Our knowledge of immunology has grown considerably since Dr Jenner pioneered the smallpox vaccines in the 18th Century by which he is often called the "father of immunology". Immunology intersects with multiple areas of biomedical science from infectious disease and vaccination to the management and treatment of chronic diseases such as diabetes, asthma, allergies, and cancer. It is also now becoming clear that immune responses are key to the development of many common disorders not traditionally viewed as immunological, including metabolic, cardiovascular, and neurodegenerative conditions. Immunology is also fundamental to the life sciences industry; the discipline is core to the development of modern antibody therapies, cellular therapies, small molecule drugs, vaccines and 'biologics' (therapuetic biomolecules). Immunologists are employed in a varied range of organisations across different areas in science and medicine from the NHS, pharmaceutical/biotech industries to universities. Immunologists work in the field of immunology, a broad branch of biomedical sciences that deals with the body’s immune system in health and disease. Immunologists can work as scientists or clinicians across different areas of biomedical research and in diverse clinical specialities ranging from allergy to cancer. As well as dealing with human illnesses, immunologists also work within veterinary sciences . The work immunologists undertake varies depending on their interest area and the organisation they work for. Check out our career case study library to gain insights into the type of careers immunologists do. Immunologists are actively involved in the drug discovery process in the pharmaceutical sector especially for the development of antibodies and vaccines. 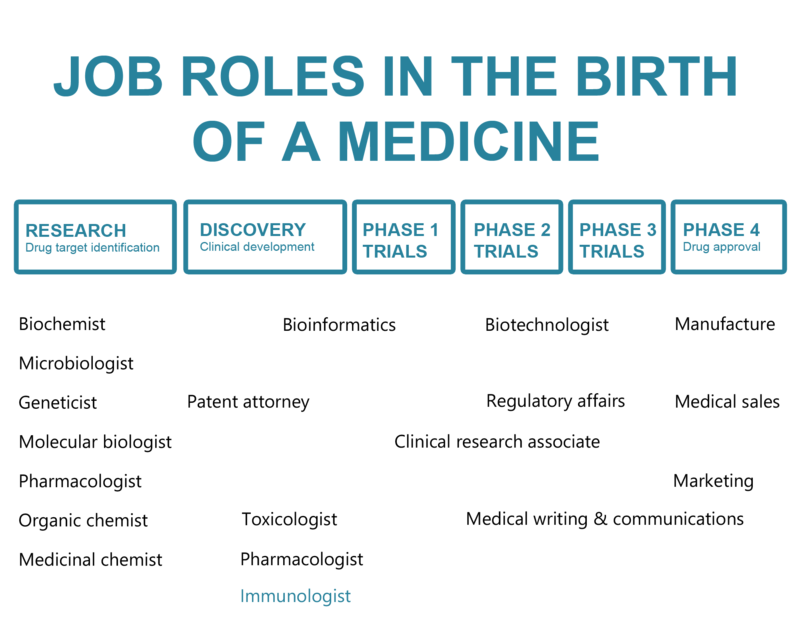 Type of roles will depend on level of experience upon entry but usually candidates hold a PhD.